One of the most interesting findings from our customers interviews was how the value proposition that virtualization delivers evolves across the journey. Mind you, I am talking about what customers told us, not what VMware marketing says. At the beginning of the journey (IT Production), it is all about cost efficiency around server consolidation, space, power and cooling savings. 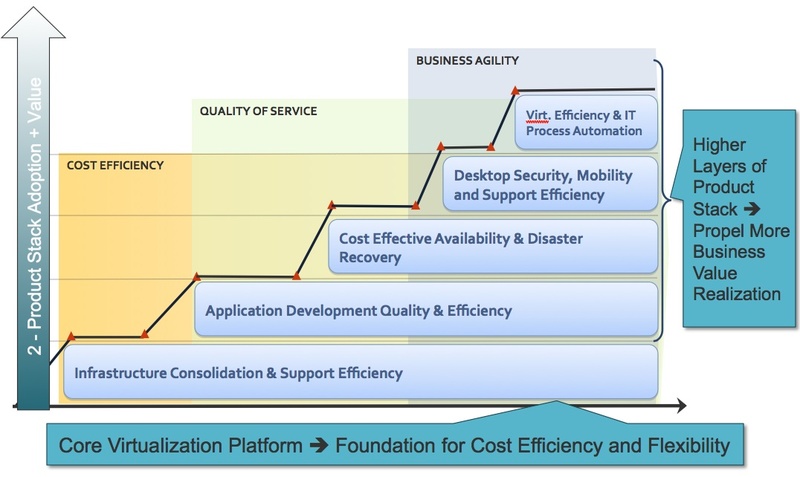 When customers enter into the Business Production phase and they start virtualizing business applications and production databases, the value proposition is all around better quality of service and business continuity. This shift is sudden and dramatic. 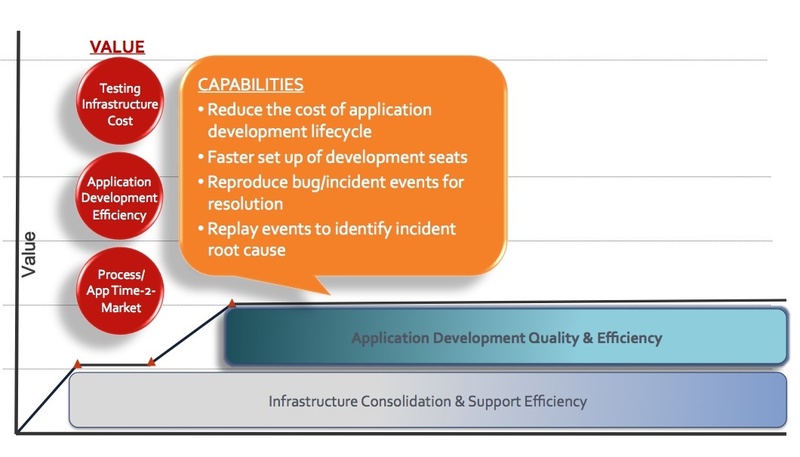 It is like cost savings from consolidation is taken for granted at this stage and customers switch their focus on faster provisioning, better capacity management, reliability and process automation for their business applications. This is where features such as High Availability (HA), Fault Tolerance (FT) and SRM become important. 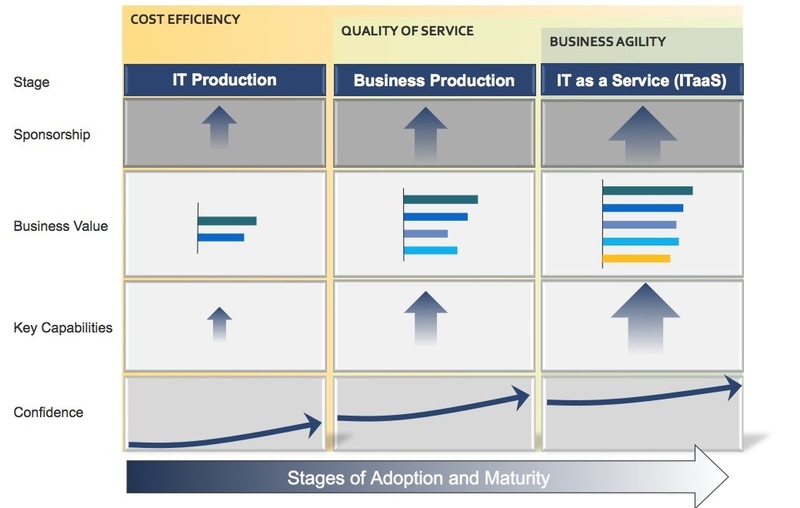 At the right side of the journey, it is all about business agility. Customers are on a path to virtualize as much as they can of the IT environment so that they can scale up the benefits derived from virtualization and achieve more process automation, faster time to market, and dynamic allocation of resources to cope with varying demand. This is the stage that gets them closest to running a private cloud. More on this in later posts. 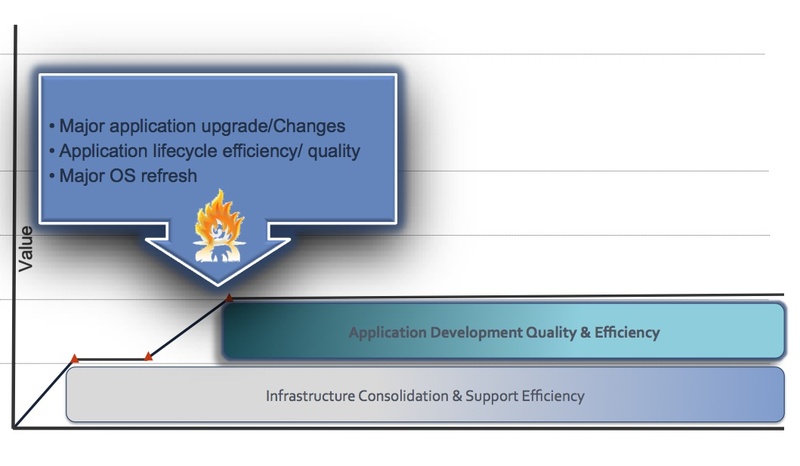 The journey also evolves along a second axis: the VMware Product Adoption that is which functional areas of the VMware product portfolio a customer deploys overtime. The core platform with ESXi and the basic management capabilities of vCenter provide the foundation for hardware abstraction, consolidation and CAPEX savings along the whole journey. 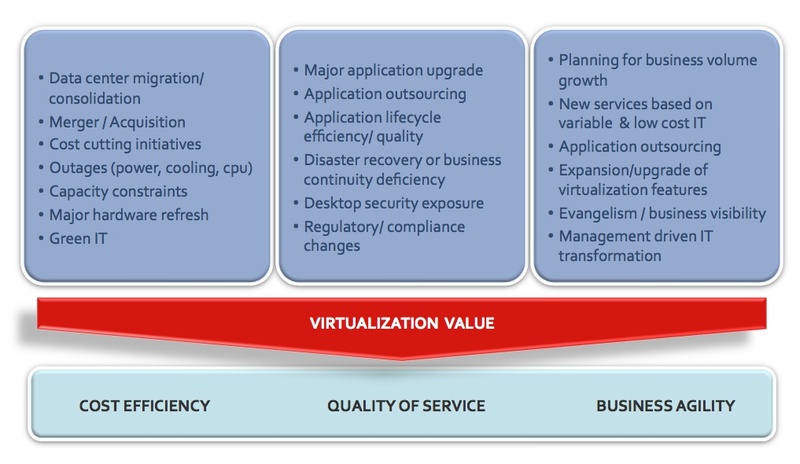 To unlock the higher level business value of virtualization, customers need to adopt and deploy the upper layers of VMware product stack. SpringSource add some very nice application management and monitoring capabilities with Hyperic, a lightweight development framework (Spring + Tools) and a lightweight run-time container (tc Server). Although adoption stages and product adoption are somewhat related (e.g. customer who virtualize mission critical applications tend to aggressively deploy features such as HA and FT), each customer will follow their very own path in deploying the different functional areas of VMware’s product stack. The path mainly depends on what their business triggers are (e.g. running out of data center space, hardware refresh, security compliance on the desktop) and their business priorities. As part of our customer journey project, we built a taxonomy to map triggers to functional areas, to capabilities to business value. This is how we help customers define the custom journey that best maximize business value returns based on their set of triggers and concerns. To do so, we first enumerated all the business triggers that are relevant to virtualization; then we mapped which product area addresses each business trigger. From there, we listed all the capabilities and the business values that each product area delivers. And this is the drill down for the set of triggers the typically spark the deployment of Lab Manager.